The next election is scheduled in 2012, at the age of 58. Between the ages of 57 and 62, the 1st (Self) House in transit, @, is in Cancer. In relation to @ in Cancer, the 9th (Exaltation) House is Pisces whose Ruler is Jupiter (5). Therefore while @ is in Cancer, Jupiter (5) represents honor. In the birth chart, Jupiter (5) is in conjunction with @, the clearest indication of another success. In the transit chart, Jupiter (5) is in Aires. Aires is the 10th (Career) in relation to both @ and Lagna. The planet that now represents honor is in the House of career. Jupiter (5) in Aires is also strong in Assistance position. This book is written in 2009. 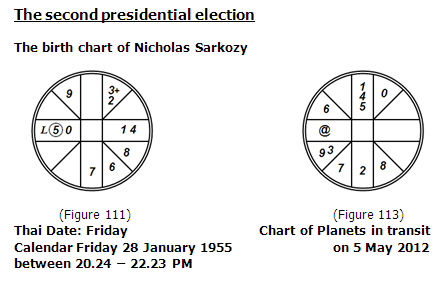 If the birth time that we estimated is correct, we see him winning again in May 2012.